We propose a construction method for self-supporting structures that uses chains, instead of a dense formwork, to support the blocks during the intermediate construction stages. Our algorithm finds a work-minimizing sequence that guides the construction of the structure, indicating which chains are necessary to guarantee stability at each step. 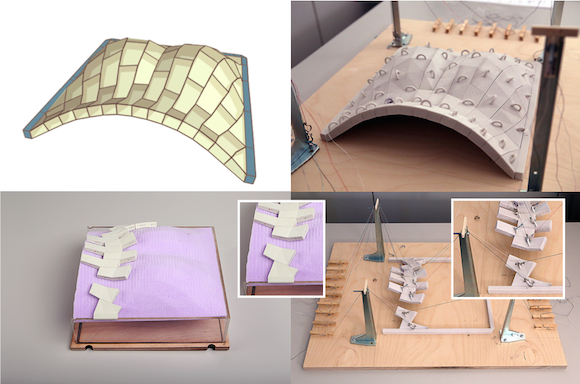 Top left: a self-supporting structure; Bottom: an intermediate construction stage with dense formwork and an intermediate construction stage with our method; Top right: the assembled model. We thank: Hao Pan and Xiaoming Fu for providing their source code and support. Etienne Vouga, Fernando de Goes, Ramon Weber and Matthias Rippmann for providing datasets. Bailin Deng, Andrea Tagliasacchi and Sofien Bouaziz for inspiring discussions. This research was supported in part by the SNF Grant (200021-137626) and received funding from the European Research Council under the European Union’s 7th Framework Programme (FP/2007-2013)/ERC Grant Agreement 257453, ERC Starting Grant COSYM and ERC Starting Grant iModel (StG-2012-306877).